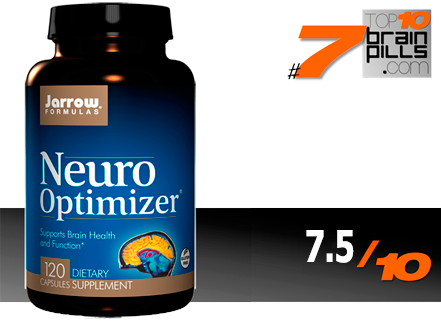 Neuro Optimizer is Jarrow Formula’s offering to the nootropic industry. They take a more creative approach by differentiating themselves as not only a nootropic product that may enhance cognitive abilities, but also makes sure the world knows that they have created a brain metabolizer. It stands out from all the other nootropics out there in this respect, as well as the fact that they’ve created an all-encompassing brain capsule. So the big question is, can this product beat our 2015 Best Of Winner ? Keep reading to find out. As we can see, it’s almost obvious that Jarrow Formulas has employed a great minimalistic formula, containing only 7 ingredients. Being one less ingredient than the great Biohack Pure, but one more than the flop that is Focus Boost, it falls in an awkward place. However, at least, they’ve realized the wrongs of most supplement companies who try to put every possible ingredient in their product, trying to create an all-encompassing pill. When you only have so much space in a pill or capsule, less is more. Neuro Optimizer’s list of ingredients contain ingredients that you’ll see in the best nootropics out there. Acetyl-L-Carnitine offers increased focus and alertness, while Phosphatidylserine has been shown to increase motivation and elevate mood. Interestingly, though, they’ve also included Taurine, a nootropic supposedly said to help enhance memory. It seemed as if most of those who tested Neuro Optimizer did not notice any significant differences when they started taking it. There simply was no optimization. Despite this, we persisted, due to the fact that some nootropics do take a while before they kick in, depending on the person of course. Our readers also agreed that the effects of Neuro Optimizer were more evident with continual usage. Jarrow create some great products, and Neuro Optimizer is one if you are prepared to commit to long term use. There is better out there, and products that do more for attention and energy. So still no challenger to our 2015’s #1 rated product . Perhaps Jarrow will come back stronger in 2016.